Want To Be a Cowboy? | TRPC | Tallahassee Rifle & Pistol Club, Inc.
Every little boy out there wanted to be a cowboy when they were young. Who says you can’t be a Cowboy when you grow up. In southern Leon county on the 3rd Saturday every month, that is exactly what the Big Bend Bushwackers do. 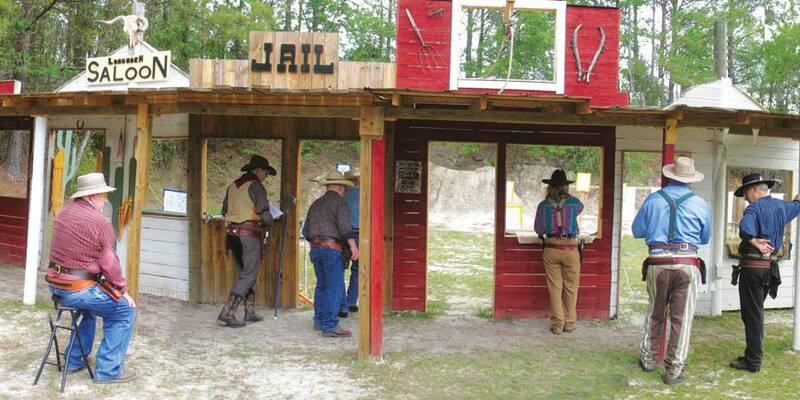 The Bushwackers are a cowboy action shooting posse who shoot at the Tallahassee Rifle and Pistol Club. This group of wanna be cowboys and cowgirls is comprised of mostly adults, but has its share of young guns who participate. They dress up like cowboys from the old west, get out their single action irons and head to the range for a fun filled Saturday once a month. Last October, a local television station, WFSU, came to TRPC to do a documentary about cowboy action shooting. When the new season for that show named “Local Routes” aired the 1st episode of season 5 on March 14, our cowboys all became famous. Although most of them were already infamous, people the likes of Jesse James, Christian Mortician, Deadeye Davis, Tuff Willy, Wabash Valley Slim and Pearly Heart just to name a few. Follow this link to see the segment on WFSU. Stay out of trouble and keep yer powder dry, cowboy!